This set of MATLAB Multiple Choice Questions & Answers (MCQs) focuses on “Graphics”. 1. What are the functions to see the graph of a continuous and a discrete function? Explanation: The pre-defined function in MATLAB to view the graph of a continuous and discrete functions is plot() and stem() respectively. There is no such function as cont() or disc(). 2. Find the error in the following code. Explanation: It is highly important that the length of the variables, between which we need to plot a graph, be same. This is a pre-defined syntax of MATLAB so MATLAB will return an error if the lengths are not same. 3. What is the output in the following code? Explanation: We have used the axis command before the plot command. So, the plot hasn’t been created before the axis command is invoked. Hence a graph of x and y will be shown which will have axes. 4. If we want to plot matrix arguments, which of the following gets plotted? Explanation: We have to keep in mind the order while trying to plot two matrix arguments. MATLAB will take the column wise relation between the two arguments. So, if x=[x1 x2 x3];y=[y1 y2 y3]; plot(x,y)- MATLAB will generate a plot between (x1,y1),(x2,y2) and so on. 5. To bring the scale of each axis to logarithmically spaced, the student entered ‘semilogx()’. What really happened? Explanation: semilogx() is a pre-defined logarithmic plot function in MATLAB. It will help to bring down the scale of the x axis in out plot to logarithmically spaced values. 6. What kind of a plot is this? 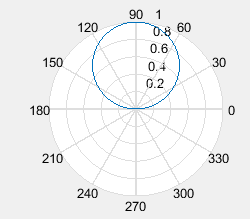 Explanation: MATLAB generates a polar plot to represent the polar co-ordinates of a trigonometric function. This is done with the help of the function ‘polar(angle,radius)’. The angle increases in the anti-clockwise direction. 7. After trying to plot a pie-chart, the student finds that the function he used is rose(). What is the nature of data used by the student if an output graph is generated? Explanation: The student gets an angle histogram plot. So, he used the wrong function. But the plot was generated. So, his lines of code have defined the date in terms of angles. Plus he has used the rose command in place of the pie command. Explanation: This is a pre-defined function in MATLAB. If we want to place a text at a position, of our interest, in a graph- we need to use the gtext command. 9. What is the condition on x in bar(x,y)? Explanation: The values of x should be increasing monotonously or decreasing monotonously. This is due to the fact that each argument in x refers to the particular position of a bar in the bar plot. 10. If we put bar(x,y,1.2), we will get _____ bars. Explanation: Usually, the default value of width is 0.8 for the function ‘bar()’. Now, if we increase bar width to a value more than 1, the bars would overlap on each other- resulting in a bar plot of overlapping bars. Explanation: The function to be used is plot3(x,y,t). This will allow him to draw a 3d plot as asked. The plot will show both the functions ‘f’ and ‘g’ with t on the z-axis.